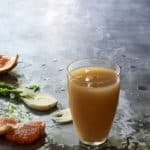 This grapefruit fennel juice with apple is fantastic for detox, weight-loss, and digestion, and has a sweet and musky flavor that is divine. I get a lot of emails asking how to juice fennel bulbs and for fennel juice recipes. So, here is my favorite fennel juice recipe and the lowdown on the benefits of juicing fennel. Fennel not only adds a mild, clean licorice flavor to juices (especially when paired with grapefruit or orange), it’s naturally warming, too, so brilliant for balancing the cooling effects of fruit. That apothecary-earthy flavor can easily overpower other ingredients of less noble lineage, though, so start with a slice and add to taste. Both fennel seed and its cousin anise are used widely in mouth fresheners and toothpastes. Drinking fennel juice will freshen your breath, too. That’s just the start of the benefits. Fennel’s nutrients build healthy blood and help reduce inflammation in the digestive system. Rich in potassium, fennel also helps to lower and regulate blood pressure and cholesterol, combat anemia, indigestion, constipation, diarrhea, respiratory disorders, and menstrual disorders, while promoting brain and eye health. A small amount of fennel bulb (minus the fronds, which are more strong-flavored) is all a batch of juice needs. Fennel pairs beautifully with greens, to mellow out their bitterness without adding sugar as fruits do. Grapefruit was just meant to go into the juicer with fennel for our culinary pleasure. Grapefruit juice is rich in vitamin A, beta-carotene and lycopene (both especially abundant in red varieties). As you pucker up, bear in mind that you’re helping regulate your heart rate and blood pressure, boost your immune system, and keep your skin’s healthy glow. An excellent source of antioxidant vitamin C, of course, along with potassium electrolyte, grapefruit provides moderate levels of B-complex vitamins and minerals including iron, calcium, copper, and phosphorus. If you’re taking prescription medications, though, you want to consult your doctor before eating grapefruit, as it interacts adversely with a variety of drugs. Though grapefruit like other citrus fruits comes into season in early winter, it’s cooling. 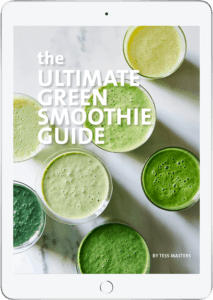 I use it in any season for its detox power, nutrients, and low sugar content. Ginger, fennel, and cayenne are all good options to right the thermal balance. Before juicing, peel or cut the rind off your grapefruit, but leave the white pithy part, where a lot of those powerful nutrients reside. Grapefruit’s tangy juice goes great solo, or mixed with a variety of flavors—particularly beet, lime, fennel, and greens. 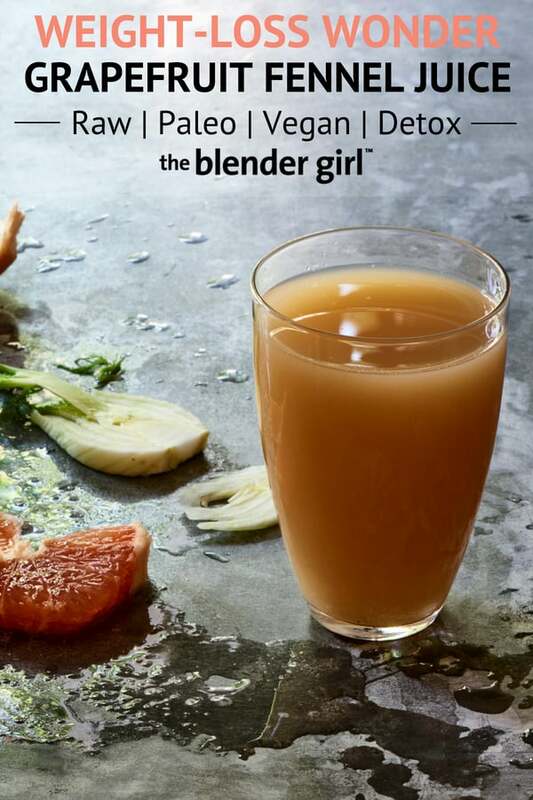 I sweeten up the tartness of the grapefruit with apple in this juice. Tasty, able to break down toxins, lower cholesterol, and enhance digestion, apple is a popular, versatile, and cost-effective go-to for juices. With phytonutrients, powerful antioxidants like quercetin, vitamin A (in the peel), vitamin C, and significant potassium, apple is a prime detox food that’s available year ‘round. As an aid to cleansing, apples’ high pectin content provides a great bowel regulator, able to slow the colon down or speed it up, as the body needs. Apple is a cooling food, and I include it in juices to balance the bitterness of leafy greens and other vegetables. The sweet tang of apple blends with almost all fruits and vegetables; my preferred variety is Granny Smith, which has a tarter flavor and lower sugar content than common reds like Fuji, Delicious, and Honeycrisp. That said, this fruit is versatile, and this recipe works with any apple you have on hand. I recommend coring apples before juicing, as the jury is still out as to whether the bit of cyanide occurring naturally in the seeds is detrimental to health. I always add lemon to any detox juice. Lemon is the queen in the realm of cleansing. 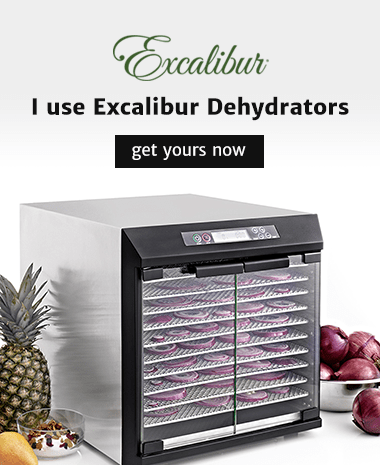 This highly alkalizing fruit is a potent detoxifier and natural antibiotic that improves liver function, relieves constipation, helps dissolve kidney and gall stones and kills certain intestinal parasites. The high levels of vitamin C helps boost immunity and alleviate symptoms of osteoarthritis and rheumatoid arthritis, as well as fight the development and progression of atherosclerosis and diabetic heart disease. Lemons also provide ample calcium and magnesium for strong bones and teeth, along with unique compounds that have powerful antioxidant and anti-cancer properties. The flavonoids in lemons have even been shown to halt abnormal cell division. Give this grapefruit fennel juice a go and prepare to go to heaven! Push the ingredients through your juicer, and strain with a fine mesh sieve.